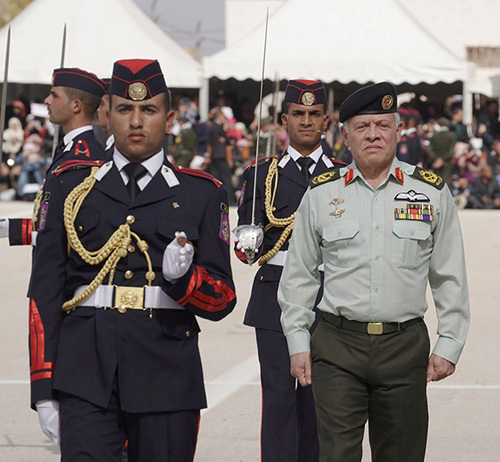 His Majesty King Abdullah II, the Supreme Commander of the Jordan Armed Forces-Arab Army (JAF), on Monday patronized the graduation ceremony of the 2nd batch of “Knights of the Future” officers at the Royal Military College, Petra news agency reported. The King arrived to a 21-gun salute at the site, where he was welcomed by Chairman of the Joint Chiefs of Staff Lt. General Mahmoud Freihat and the College’s Commander, as a brass band played the national anthem. His Majesty reviewed graduates who paraded before the podium. Mufti of the Jordan Armed Forces-Arab Army Brigadier General Majed Darawsheh delivered a speech, in which he praised the graduates, “who stand together for the sake of our national security and stability”, recalling JAF martyrs who paid the ultimate price to defend their country. He called the graduates “a national asset”, as the officers had received training to embrace the key principles and values of military service and acquire leadership skills. The College Commander said his military institution had constantly kept improving its performance and the quality of its graduates who adhered to JAF training curricula, including field training. Towards the end of the ceremony, the Supreme Commander presented awards to outstanding graduates, as a representative of the Army Chief handed diplomas to the graduates. Attending the graduation ceremony were HRH Prince Rashid bin Al Hassan, chiefs of security agencies, local governors, senior officers, a number of military attachés in the Kingdom and relatives of the graduates.